There’s little to no chance that your dog will gladly put away its toys or hang its leash on a hook. As much as you’d like to count on your pet to fulfill small tasks that keep your home organized, this one’s on you. Having a pet means a welcome addition to your family, but it also comes with a few extra jobs that can produce exhaustion and frustration if they’re not handled properly. It’s easy to spoil your feline friend with the latest cat tree or tower, or a small, toy mouse to play with. Pets do need a little play time, and pampering them with the latest and greatest seems a fun idea. After all, they deserve a little extra love now and then. But before you embark on your next trip to the pet store, consider everything your pet already has. Keep a tab on what they have and what they actually use. If something is sitting around your home, perhaps it would be better off donated. And be sure to get rid of any damaged items that are laying around and taking up valuable space. Stylish containers and boxes are an excellent way to hide your pet’s not-so-eye-catching toys and supplies. Instead of leaving them lying in the open, purchase some trendy containers and eliminate a little clutter from your life. When it comes to food storage, there are a variety of options. A separate box to hold your pet’s food can keep food bags out of sight and mind. Set aside a place in your home — a mudroom, your basement, a space in your garage — that can be dedicated to your pet supplies. You’ll have the occasional toy in the room across the house, but keeping everything in one place helps out with organization. Besides, if you have a guest who is allergic, this will help keep them away from items that could pose problems. 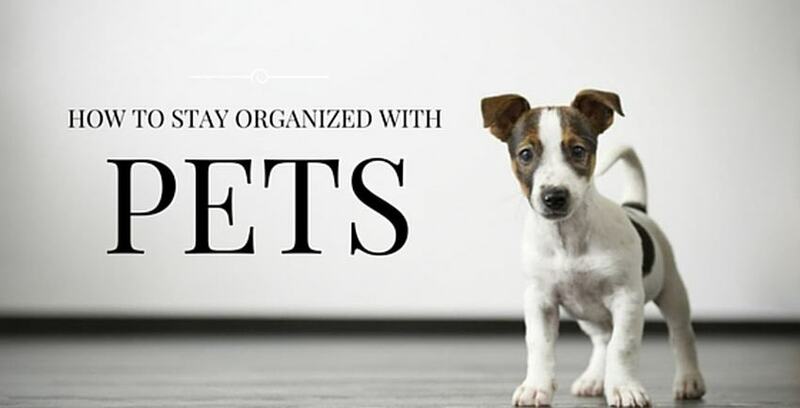 Just like you have a room for your things, your pet can, too! Be sure to keep veterinary records organized and in one dedicated place. That way, should you ever need them, you’ll know where to look and what you can expect to find. This is also the perfect chance to double-check that everything is current and up-to-date. Be sure you have all health, immunization and veterinary records close at hand. Making copies might be a good idea, too. When you need to get rid of some of your own stuff to make room for a pet, or it’s time to put some pet supplies into storage, Storage Direct can help. Our nationwide, secure facilities are the ideal fit for your storage needs. We offer a variety of unit sizes and storage types, so you can choose the right option for you. Contact us today to learn more.